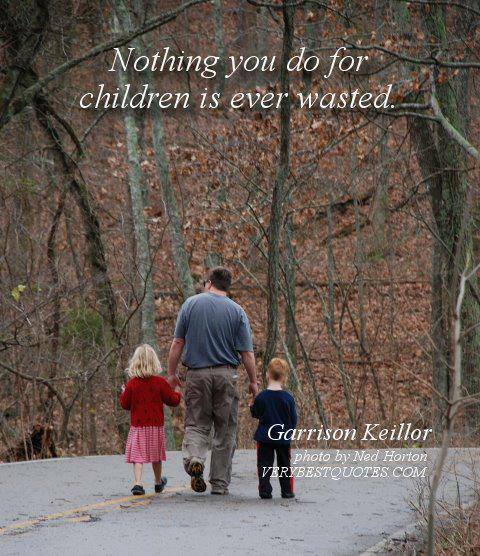 I recently read something on Facebook that was attributed to Garrison Keillor that I wanted to share with parents: Nothing you do for children is ever wasted. Now those are words to hang on to, especially during the challenging preschool years! My Facebook comment was: Your children won’t remember everything you do for them, or adventures you share, or even every book or song. It might feel like it’s a wasted effort sometimes, but it’s not. Everything you do is important, and your children will benefit greatly, and so will you. I know parents sometimes wonder about all the effort that they invest in the moment, knowing full well that their children are young and won’t remember. Some may even be tempted to enroll their children in preschool with a plan to homeschool later when they think their child will remember – but those toddler/preschool years are important, too! It’s true that kids don’t remember day to day, but all that we do with and for them has a cumulative effect, and the only waste would be wasted learning opportunities if it hadn’t been done. Children don’t have to remember everything when they are grown to have it be important in their development. Every day counts.You probably remember a few things that were important to you when you were young. And now you are the one making a difference in a child’s life every single day, even when it doesn’t seem like it! It’s never wasted time, and years from now, you’ll share stories and photos of their childhood, and be grateful for the time you spent with them. What a priceless gift! Written by Karen Taylor, posted on 24 July 2013 at 9:19 am, and filed under Encouragement, New homeschoolers, Preschool. Bookmark the permalink.